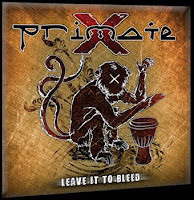 RockUnitedReviews: PRIMATE X: "Leave It To Bleed"
As much soaked in the tradition of Alice In Chains and stone grooved post-grunge melodies as melodic rock and progressive vibes, the Swedes of Primate X are fast becoming in demand at the local Stockholm live circuit and on the web. 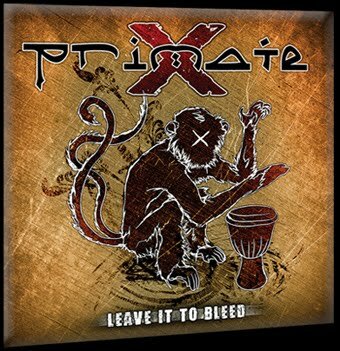 "Leave It To Bleed", their first 4-track CD single, and according to these tracks, expect a groovy attitude and quite the excellent production on the upcoming album, "A Fool's Game". The band (JP Asplund - vocals, Felix Kvaernå - guitars, Anton Holmberg - bass, Max Wallberg - drums) are currently a force to be reckoned with as they had tens of thousands of listen on Myspace and even received acclaim from the rather posh mag, Slitz'. I'm however not entirelly sure if the latter is on a positive or negative note? But you can't look past the quality of this single though. The drum beat sits nicely inbetween the grooves of Cavalera and Ward, and the vocals has clearly been somewhat influenced by Ozzy and especially Layne Staley's impassioned and sometimes desperated cries. Not to mention that Felix is a cool cat/six string bender with several tricks up his sleeves. Do they have the material that could bring them to the next level? Yeah, maybe, these four tracks are all similar in structure with a groovy beat and ditto arrangements. Definitely a band to look out for in the future. Let's hope they have a couple of surprising moments and not just groove on the upcoming CD.